Hey everyone! I must be getting old or something because the guest posts that really stand out to me lately are ones about kids. Maybe I have the itch or something? Who knows haha. But today's post by Laurie from The Three Year Experiment is about something I LOVE. Travel. My wife and I have really started to prioritize traveling, and something I've always wondered about is how we're going to be able to do it with kids. 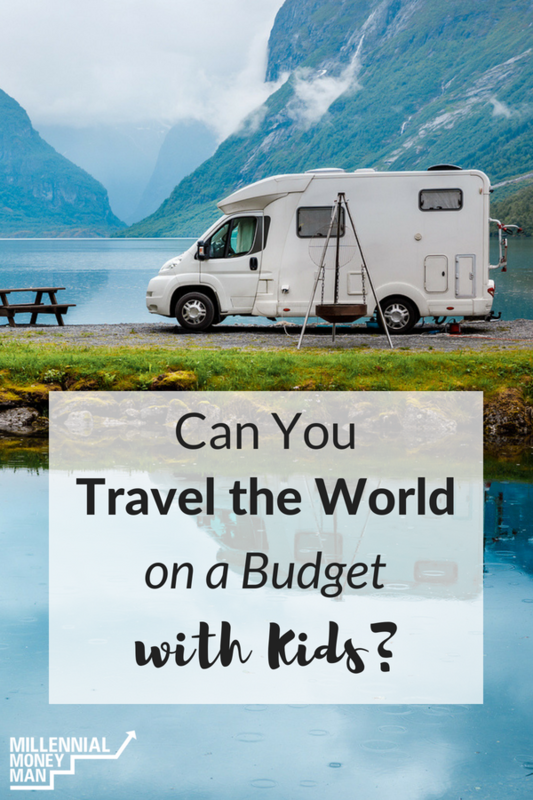 Even more important – how can we travel with kids and not spend way too much money? My family is currently on a three-year journey to double our net worth and become location independent. Location independence? What does that even mean? Several years ago, I followed a blogger who took an around-the-world trip with her family. As I gazed at her pictures, I imagined my own family traveling across continents, being “world-schooled,” opening up their young minds to the different religions, opinions, ethnicities, and customs. Her family made the trip work because she and her husband worked remotely. They had online businesses and book deals and were able to take ten months and travel. Our family was a little different. My husband is Chilean, and we met when I lived in South America in my 20s. We were both diametrically opposed to the idea of dating someone from our respective countries, so, of course, we fell in love and got married. We moved to Atlanta, Georgia, the region where I was from, and he got a job in translations while I worked in marketing. In the next few years, we had two kids and began to raise our family. Then, he found an incredible job opportunity in New Hampshire, so our entire family moved to the Northeast and settled in. He loved his job, and we’d found a quiet, idyllic community to raise our kids. But, the job had become golden handcuffs. We had to live in this area of the country for him to keep his job, but it was slowly making us miserable. Winters in New England, where we lived, were long (Long! I tell you! Seven months of snow will make a grown woman cry). It was hard to cram vacations into the three weeks a year we had available, especially because we had family in two continents, and all very far away. That’s why location independence sounded so great! To be able to work from home, or the road, and to be able to take longer vacations, even if they were working vacations, would give us the chance to see new things. We like a certain amount of stability, but we also crave adventure and novelty, and we were happiest when we took lots of vacations and had long stretches of travel to new places. So just over a year and a half ago, my husband and I hatched a plan. We figured out that if we doubled our net worth, and were able to find remote jobs (even if they paid less) then we could become location independent and create a life of travel and flexibility that suited our family’s particular needs. Location independence is a term that is flexible enough to encompass lots of lifestyles. For some families, like the around-the-world blogger I followed, it means extended travel to lots of international companies while working. For others, it means the flexibility to practice geographic arbitrage and live in a lower cost-of living-city or near family. For us, it will mean the freedom to lay down roots near our family while using summers and breaks to travel for long periods of time. My husband and I believe in traveling. A few years ago, we sat down and really thought about what our most deeply held values were. We’d weathered a rocky few years right after we had our first son, including two layoffs in one year and lots of economic uncertainty. We’d spent eighteen months digging ourselves out of debt and the next decade building a solid net worth, through lots of trial, error, and sacrifice. We knew we wanted to live a life that made sense to us and reflected our most deeply held values. So we came up with three values that meant the most to us—family, financial independence, and travel. Some of those values are congruous. For example, if we travel to Chile more we’ll get to see our family there more. Sometimes those values counteract each other. If we spend more on travel, we have less money to invest for the future. But we’ve worked on fitting all three into our location independence plan. We have spent an average of about $6,500 per year on travel, for the last seven years, all while saving and investing to create financial independence (we’ve managed to save 40% of our income, on average, during those years). $6,500 is a lot of money if you’re traveling domestically, but not so much if you’re traveling internationally and with kids. So what are the ways we’ve been able to travel, but also stretch those travel dollars as far as we can? We had a home base in Santiago and then went up to the driest desert in the world for a few days. We saw breathtaking scenery in the desert, and we also relaxed and took it easy in Santiago. We swam in our apartment’s pool, went to the farmer’s market twice a week, and went to a park or museum every other day. People are usually really surprised when I tell them how cheap it is to travel within Southeast Asia. The most expensive part is getting there, but once you’re in Thailand, expect to pay $1 or so per person for the most amazing street food you can imagine or just $5 for a massage. We paid $23 a night for our AirBNB. Latin America is similarly inexpensive. We use Scott’s Cheap Flights (we pay $39 for the Premium Service each year) to find low-cost deals to those locations, and then have much lower vacation costs. The service emails us when they’ve found low-cost air deals, and then you book them yourself. For example, yesterday I saw a nonstop Boston to Barcelona deal for $265. If we find great airfare to a cool place, we’ll plan our trip around that. For our family, we make travel work while still pursuing location independence. The first thing we do is budget for it: we save money every month for our vacation fund. The second thing we do is plan for it: at the beginning of the year we plan our big trips, and make sure we’ll have enough money left for last-minute small trips, too. Finally, we take it slow: when you travel with kids, you’re not able to cram as much sightseeing into the trip as you would with just adults. So we lower our expectations about what we can do in a day and make sure we have enough time. We’re not location independent yet, but we’re excited about getting there soon. In the meantime, we’ve got a summer full of travel planned. Laurie and her family currently live in the woods of New Hampshire but are working towards their dream of location independence. Laurie blogs about their journey at The Three Year Experiment. What's the best cheap vacation you've ever taken? For me, it was driving to the Texas Hill Country to do wine tours with my wife. At the end of June, we’ll be headed to London with our four kids (9,7,4 and 2). It’s our first international trip. We’ve definately powered our expectations as it relates to site seeing. My biggest concern is getting around a big city with 4 kids! Oh I want to know how that goes! Should be a ton of fun though. We’re going to Italy later this year, and it’s the first trip we’ve taken as a couple that isn’t in the Caribbean (I went to Japan by myself yeaaaars ago). I would say our FREE trip to Hilton Head SC. We used our travel rewards for free airfare and my parents had a week timeshare they used for the whole family to stay at a very nice condo. The weather was perfect and we even got to golf with some alligators (crazy for us NYers). Travel points for the win! We’re using a bunch of those coming up here shortly as well. Hahaha you might have to start being a little more careful now that she is working with you. It’s great having a business credit card you can earn money/points from too. I am sure with your FB ad spend alone you can go on a vacation or two a year for free. At the end of April, I drove to the redwood forests of northern California. All expenses combined, gas, camping, souvenirs, tours, etc. came to less than $250. Nearly all of that was gas. When going on road trips, pack all of your meals when you can. The method I used and found it worked really well was to vacuum seal the freeze each meal beforehand, and heat it up in a pot of boiling water when it was time to eat. The best free would be our Kauai and Maui honeymoon trip. Between travel points and wedding gifts of hotel nights it was free. Not sure which trip has been our cheapest, but our most adventurous one was going to France with a 2 year old and almost 3 month old. The recommendation to take things slow and expect to site see less are spot on. We spent our first few days in Paris and our one goal was to go up to the top of the Eiffel Tower (ironic considering the blog post). It was a great trip and we did actually go up and see Paris from the Tower at night. Traveling with kids is very doable. One caveat, it does depend on the kid. Our daughter enjoys traveling like the rest of the family, but a she gets motion sickness in vehicles, so flying is our preferred method of travel. So excited for our story to be included on the blog. Thanks Bobby! Our best cheap vacay was undoubtedly an all-expenses-paid first-class trip to the Pacific Northwest for an interview Mr. ThreeYear had. The company picked us up in a niiiccce BMW with a driver, flew us first class across the country, put us up in a boutique hotel, fed us amazing food. He didn’t end up taking the job but it was a really nice trip. Traveling with kids is definitely doable, but as Laurie said, you do have to manage expectations and stay flexible! We mainly do road trips with our two boys and find little adventures along the way. It doesn’t have to be crazy expensive if you plan and look for the free or cheap options. Great points. We love road trips in our family! Great story Laurie. While not exactly the same, we are also in the middle of our “Great Indian” experiment with a 12 year old in an English medium school in India where his classmates have passports from at least 6 countries. It is only when we leave the comfort zone of our own cocoon do we discover new vistas and see there are more ways than the American way of living life. Wow. What a cool adventure! We’re currently taking a 6 month mini-retirement and traveling around Southeast Asia and Europe. We’re currently in Bali, Indonesia, and we’re spending on average less than $50 a day. AirBnb and cheap street food are the key to making the lifestyle work! Great story and hopefully location independence reaches you soon! Thanks Kyle!! Your trip sounds amazing! My husband and I took a7 day trip and drove from the Midwest to see Yellowstone & the Grand Tetons. We camped and cooked most of our meals, and even had 2 night in a hotel for about $800 total (sprained my ankle & decided a bed was worth it). The mountains were beautiful!! We spent double that recently on a trip to California, even with free airfare & 2 nights staying with family. Loved both vacations, but I’d have to say the trip to the mountains was just as great, if not better!